Pioneers in the industry, we offer ip pbx-uc500, ip pbx-uc300 and openvox ippbx-uc120 from India. It can seamlessly integrate VoIP trunks and your existing PSTN lines with maximum 8 port analog connections and 2 Ethernet ports. They are developed with a wide selection of codecs and signaling protocols, including G711 (alaw/ulaw), G722, OPUS, AMR-NB/WB, SILK, G723.1 G726, G729, GSM, ADPCM, iLBC, H263, H263P, H264, VP8.Taking full advantages of open source platform, the UC Series appliances support industry standard SIP trunks, IAX2 trunks, analog PSTN trunks, and analog station trunks. Moreover, with OpenVox up-to-date IPPBX system software, the fully-featured UC Series IPPBX is an ideal solution for the SMBs and small enterprises. OpenVox UC300 Series will be your first choice.With two distinct offerings, UC300-A11EM1/UC300-A20EM1 and UC300-A14EM1, OpenVox offers a complete set of products designed to meet your communication demand. Made from aluminium material, UC300 Series IP PBX exert great importance in dustproof and mothproof with fanless exquisite enclosed design. It is incredibly easy for you to set up UC300 with basic configuration and you can also freely install your own Linux-based software. UC300 Series support analog FXO/FXS ports with up to 300 simultaneous calls in one single device. They are developed with a wide selection of codecs and signaling protocols, including G711 (alaw/ulaw), G722, OPUS, AMR-NB/WB, SILK, G723.1 G726, G729, GSM, ADPCM, iLBC, H263, H263P, H264, VP8. Taking full advantages of open source platform, the UC300 Series support industry standard SIP trunks, IAX2 trunks, analog PSTN trunks, and analog station trunks. What’s more, it is very convenient for users to increase ports to expand the system. 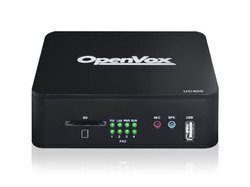 OpenVox UC120 Series IPPBX is a new generation Unified Communication terminal equipment that combines voice and data. It is compact and lightweight, and provides following voice interfaces: FXS, FXO, GSM/LTE and Φ3.5 audio interface. It is compatible with multiple service platforms and terminals and can seamlessly connect to VoIP networks, traditional telephone networks (PSTN) and mobile networks (PLMN), and provide diverse converged communications solutions. On the one hand, the UC120 connects to traditional telephones, faxes and traditional analog PBXs via a standard voice interface; on the other hand, it uses the standard SIP protocol and is compatible with most IPPBX, soft switch and SIP-based network platforms. At the same time, the UC120 supports four GSM bands to meet the requirements of global mobile communication networks. As one of the product features, the product combines a Φ3.5 audio port, which can be directly connected to a computer headset for voice calls. In addition, it has high-speed data capabilities, allowing users to high-speed Internet access via the WAN (LAN1) / LAN (LAN2) interface. 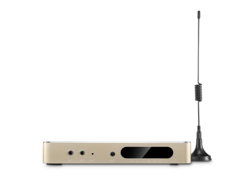 UC120 can be used as a personal communication product, and can also be used as a centralized communication product for SME, providing high-speed Internet access, enterprise voice communication, and enterprise short message transmission and reception.